Brothers, please recognize this page is a living document and we are seeking input and refinement as we develop it fully. If you have input, photos, or a differing perspective, please let us know at delta.epsilon.acb@gmail.com. 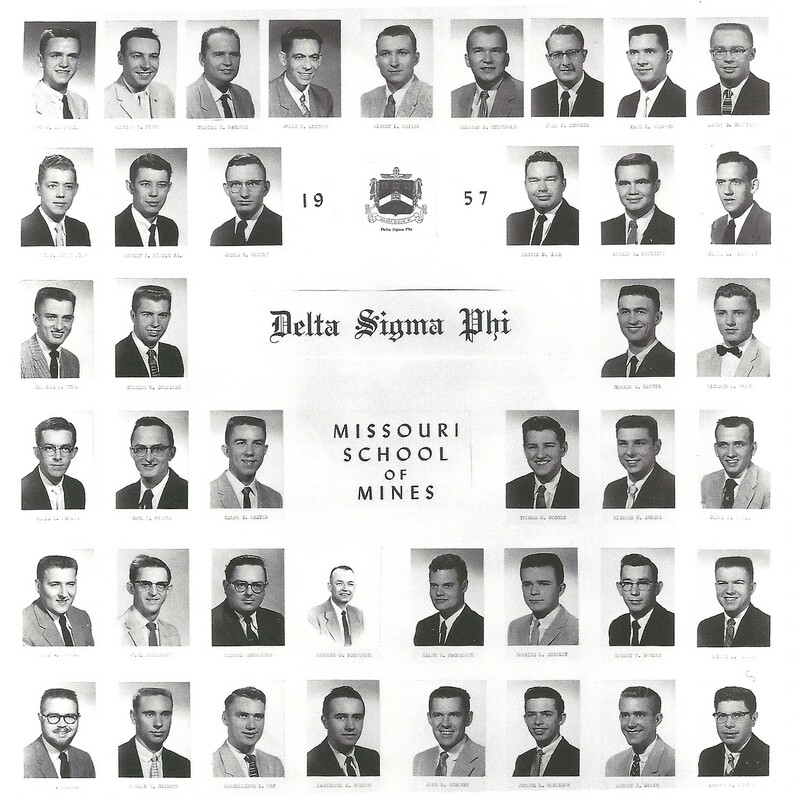 The Delta Sigma Phi fraternity chapter in Rolla began organizing in early March of 1956 with representatives from National Headquarters. By April 30, the ‘club’ was organized with Ralph McCormick as the president. On May 27, 1956 the first 16 members were initiated by brothers from Washington and St. Louis University chapters. On March 10, 1957 the Delta Sigma Phi Club was installed as the Delta Epsilon Chapter of the Delta Sigma Phi Fraternity with 29 charter members, a total membership of over 40, and Fred Dietrich as first chapter president. The speaker at that formal event was Francis “Pete” Wacker who was the fraternity executive director from 1947-78. In addition S. O. Smith, president of Delta Sigma Phi, and Curtis L. Wilson, Dean of the University, made presentations. The Faculty Adviser was Wells Leitner and one of the original ACB members was J. C. Alexander who owned Bishop’s Clothing and served until his death in 1979. By the chartering ceremony the chapter had purchased a duplex on the north side of Rolla where Thomas Jefferson housing is today, remodeled it over Christmas break, and moved in 31 residents. 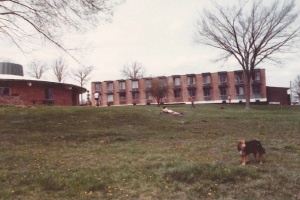 Several other buildings were included in the property and the chapter had an old military building moved from campus to the site for additional housing. Many of the initial members of the chapter were Korean War veterans looking for a more mature environment than many housing units offered. As a result hazing and many other childish activities were banned from the start. The added experiences of the older members helped in the development of the chapter and the house itself. Delta Sig at Rolla hit the ground running in campus leadership and actually had the highest scholastic average on campus even before being formally installed as a chapter. The student body consisted of 2387 males with 711 members of 14 fraternities (nearly 30%) and 17 females. Delta Sig flourished in Rolla and soon ran out of room. The university established an area for fraternities to build new houses on Hwy E (middle Rolla exit from I-44) and Delta Sig build new facilities there for occupancy in the fall of 1966. Surely the fact that the location was only a block from the regional Highway Patrol Headquarters was a coincidence. 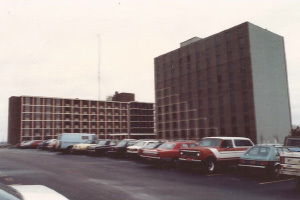 The existing site was sold to build the Thomas Jefferson Residence Halls for the school. The new digs included a residence building and a round social building. The residence (rectangular building) was 36 two man rooms and a single for the chapter president. There was one phone (364-4192) for the entire house (extension to the round house) with an intercom to notify residents of incoming calls in the evening (one of the pledge duties). The room under the president was used for an extensive file system on classes that saved many brothers anguish. Other than a half hour each evening, this building had 24 hour quiet hours. The round house had a small formal living room, large chapter lounge, kitchen and dining room. This is where the only television was located (eventually hooked up to cable). 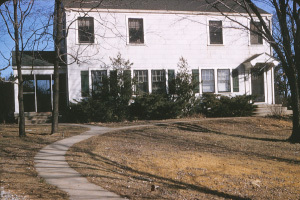 This was the site of memorable parties, frequently in association with another house on campus. There were no quiet hours in the round house and made a great place to take a break from studies. After the Old Chem Building burned down in the late 60’s, the chapter found the dump site and constructed a patio and barbeque pit from the salvaged 1885 bricks. The chapter continued to maintain stabile membership and leadership both on campus and within the Delta Sig realm for a number of years. In the late 60’s there was a significant influx of university athletes into the house which provided fertile ground for recruits. The chapter was known for holding leadership positions on campus (student council, IFC, Student Union Board, honor societies, and focused organizations), being very involved in campus activities, and maintaining high scholastic standards. In the early 1990’s Delta Epsilon ran into some very rough times. Pledging was down, which means income was down. Eventually the house could no longer afford to pay a cook. Meals were prepared mostly by heating canned or prepackaged food. Needless to say the house could no longer compete with the other Fraternities on campus. By the start of the Fall semester in 1995, it was clear there were not enough members and new pledges to keep the chapter afloat. The Chapter notified national that they were no longer able to sustain a chapter and were all going their separate ways. Ron Hoffman and Ward Merrell, current and former ACB presidents, met with Tony Smercina from national to collect the Charter and exchange the chapter’s assets for its debts with the university. In October 1995, national took the Delta Epsilon Charter. The round house and the rectangular building were signed over to the university in exchange for the university paying off several thousand dollars in outstanding debt and making repairs to the roofs of both buildings to stop the leaking. Mr. Smercina returned to Indianapolis with the Delta Epsilon Charter. 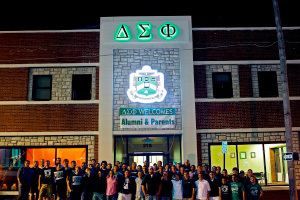 Delta Sigma Phi was no longer a Fraternity on the University of Missouri – Rolla campus. The buildings were used for university office space and storage for a number of years but were allowed to fall into disrepair. The rectangular building was eventually demolished in 2011. The round house is still used by the university (2013). With stimulation from national, the glimmer of Delta Sig at Rolla started again. The high standards of the initial chapter were maintained as members were solicited. Under the on campus leadership of Faculty Adviser Paul Hirtz, Delta Epsilon was re-colonized in 2006 and re-chartered in 2008. 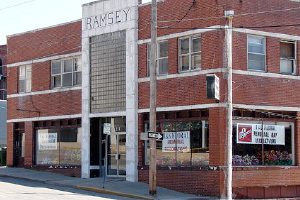 In August of 2009 the chapter moved into the newly renovated Ramsey Furniture building at 8th and Rolla streets on a lease with option to buy in five years. With a lot of talented and dedicated members of the ACB, to include Ron Hoffman who had to shut down the chapter in 1995, the chapter was given the opportunity to flourish. They have taken the opportunity to grow, develop, and lead until they now are once again recognized as leaders on campus, in the community, and with national. On campus they maintain one of the highest grade point averages, hold leadership roles in campus organizations, and sought for input on campus operations. The chapter maintains active membership in the downtown business group and helps with several special functions each year. They have even received donations from businesses to help with purchase of the house. Delta Epsilon has won the past three Pyramid of Excellence awards from national as one of the top chapters in the fraternity. In addition, Paul Hirtz has been recognized as the outstanding adviser for the fraternity (first award issued since 2007). In November of 2012 the house was purchased, two years ahead of the most optimistic plans. Due to good financial management from the ACB, strong recruiting of quality brothers by the chapter, and support of the Rolla community, the chapter bought not only the house, but apartments and a beauty salon adjacent for future expansion.